Portrait of african american young woman dressed warm wearing beanie hat and white jacket blowing snowflakes from hands into the camera standing in winter forest. Concept of outdoor recreation. Lost African american girl dressed warm wearing a red hat, scarf and white jacket standing in winter forest and frightened looks around. 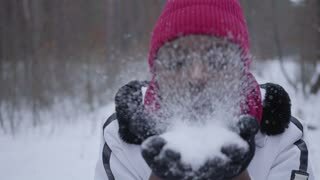 Portrait of african american girl dressed warm wearing beanie hat and white jacket blowing snowflakes from hands into the camera standing in winter forest. Concept of outdoor recreation.